I've been avoiding checking out MASTER BOOT RECORD's material, perennially a bestseller on Bandcamp in the metal section, for some time now, for all the obvious reasons. A chiptune metal hybrid? Songs named after commands in MS-DOS systems of the early 90s? Of course it's a bestseller on Bandcamp; this is the Internet we're talking about. But underneath the Generation Y nostalgia of C:\>CHKDSK /F, his first full-length, is a well-composed, competently made album. For those who don't keep up to date on Internet fads, chiptunes are synthesizer-made songs that those of us over the age of 20 may remember from video games and teenage attempts at making dance music on one's computer. As advertised, this is 100% synth, with extra helpings of synth on top. The guitars are the overdriven pseudo-guitars of old-time MIDI systems, providing volume and low end but little raw power, while the bass, always a better fit for synthesizer in general, pulses smoothly at the bottom of the mix. The best parts are where MBR focuses on his lead synths, a combination of symphonic neoclassical and lead-solo wankery of the sort that filled the background music of the games we played twenty years ago. No warmth here; all the synthesizer sounds are cold and harsh, the sound of basement electronic gear, but the pace is quick. While there's a beat, it's not dance-oriented at all; this is the sound of the 90s computer nerd, and dancing is definitely a foreign activity; 16-bit-video-game boss fights are the pastimes of songs like MSDOS.SYS or CONFIG.SYS. These songs fly; the missteps come when, eager to integrate more metal and produce a darker sound, MBR grabs arrangements from songs such as Metallica's Orion. Classic tunes from games such as DOOM are easy to mix into the MBR sound; marching beats from industrial music, which was just coming into its own by the end of the classic PC game period, are similarly a good fit. But covering portions from classic metal songs are another thing entirely; the result doesn't fit well. Better is the crisp demo-scene techno of NWOSHM.TXT, my favorite song on the album, whose strong rhythm and chattering, jagged synth melodies give the tune some extra bite. The guitars get a bit overwhelming with their constant barrage of grinding roboticism, but MBR takes the pressure off just often enough to keep the listener from getting a headache. 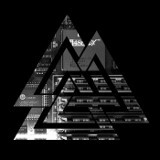 Nostalgic current and former gamers will probably eat this stuff up, but C:\>CHKDSK /F is also a decent album to give a spin if you like synthwave of the Perturbator variety.